Blacktown City Council Mayor Stephen Bali, SALSA founder and Associate Professor Smita Shah, Rooty Hill High School Council Life Member, Helen Fone. 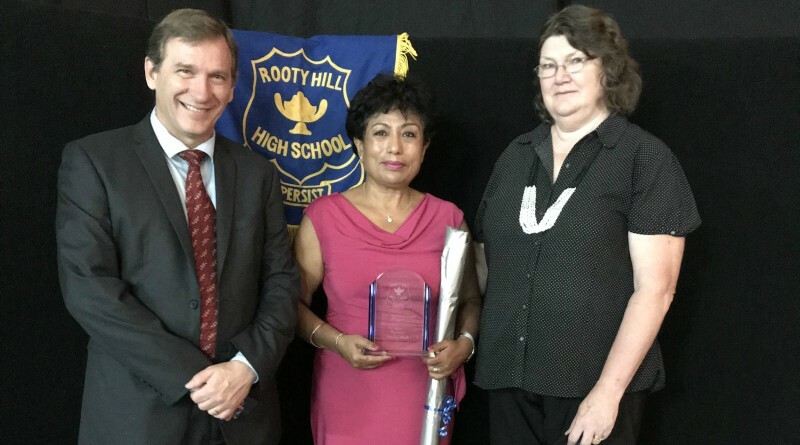 Rooty Hill High School Council and the Parents and Citizens Association have awarded Western Sydney Local Health District (WSLHD) Primary Health Care and Research Unit director Smita Shah an award for her outstanding community contributions. Associate Professor Smita Shah was recognised for her work as the founder of the Students As Lifestyle Activists (SALSA) program. She is the driving force behind the success of the ten-year-old program, which is run in conjunction with the local General Practitioners Association. The program involves university students training peer leaders to teach younger high school students about healthy and active living. Smita has continued to develop the award winning program and has implemented it in nearly 30 schools across western Sydney. She has actively engaged with parents, contributed to events, and has worked with the GWS Giants and Blacktown Council to ensure young people from this school have the opportunity to have a voice in local issues. Smita is tireless in her support of the schools she works with and in the enthusiasm and belief she has in the western Sydney community. Smita said her award is an opportunity to grow the SALSA program even more. “This award will help us implement the SALSA program at more schools in the area,” A/Professor Shah said. For more information about the SALSA program or to get your high school involved, tap or click here.